55-2957 YF-104A QFG-957, mentioned is a “dog fight” mission against a F-4D on July 19, 1967, shot down as a drone August 8, 1967, no further details known; 4 drone flights. 55-2963 YF-104A QFG-963, painted orange overall, shot down February 1, 1962 by Bomarc surface-to-air missile on 1st drone flight. JF-104A QFG-965, QF-104A modification November 1964, JQF-104A modification November 8, 1965, shot down March 1, 1967 by AIM-4D; 5 drone flights. 55-2966 YF-104A QFG-966, written off June 14, 1967, lost pitch control, destruction failed, guided over the Golf of Mexico until it flamed out; 3 drone flights. 55-2968 YF-104A QFG-968, lost in the Golf of Mexico on September 14, 1962 being out of control on 2nd unmanned drone flight; 2 drone flights. 55-2969 YF-104A QFG-969, September 28, 1968 hit by AIM-9, recovered, flown again, shot down January 26, 1971 with AIM-4H, fired from F-4E; 25 drone flights. 55-2971 YF-104A QFG-971, on December 8, 1965 the QF-104A was hit in its nozzle area by an AIM-4 during an unmanned mission. The "damaged" aircraft could be landed, but blew a tire during the landing with no further damage to the QF-104. It was repaired and flew again soon; during “weather penetration” mission on June 21, 1966 struck 3 times by lightning strikes; shot down October 27, 1966 by AIM-7; 11 drone flights. 56-0730 JF-104A XQF-104A QFG-730 in June 1960, lost canopy during take-off on June 6, 1963, written off October 26, 1967, lost pitch control, destruction successful; 14 drone flights. 56-0733 JF-104A QFG-733, on November 29, 1961, designated JQF-104A, on May 31, 1968 it suffered a severe class A landing accident at Eglin AFB, re-modified to F-104A in May 1970, used by Darryl Greenamyer between 1974 till 1977 for spare parts (N104RB race-jet), used for Japanese movie purposes as "36-5019" at Mojave AP in 1987, display at Science Fiction Air Park at Arlington, Texas coded with fake serial56-763/FG-763, preserved at Historic Aviation Memorial Museum (HAMM) in Tyler near Arlington, Texas in April 2005, restauration in 2005, markings with code 56-733, August 6, 2006 last noted. 56-0734 F-104A QFG-734 on May 14, 1962, August 10, 1962 barrier engagement, September 7, 1962 barrier engagement, third barrier engagement in 1962 took place on September 12, but then the aircraft sustained major damage while it collapsed on February 6, 1963 barrier engagement, shot down August 1, 1963 by Bomarc surface-to-air missile; 114 drone flights. 56-0735 JF-104A QFG-735 converted to JQF-104A on September 18, 1961, barrier engagement on May 9, 1963 with broken nose gear, repaired barrier engagement on September 2, 1964, shot down June 17, 1965 by AIM-7 from F-4 of US Navy; 11 drone flights. 56-0736 F-104A QFG-736 on March 31, 1962, shot down by missile on October 4, 1962 on the 5th drone flight. 56-0737 JF-104A QFG-737 on October 31, 1961, May 4, 1971 porpoise on landing, June 25, 1971 hit by AIM-9, but recovered, shot down on July 3, 1972 by AIM-9, 21 drone flights. That was the last day that a QF-104 was lost during the QF-104 program. QF-104 56-737 flew an unmanned mission and was killed by an AIM 9J sidewinder missile at 10.000 feet at 0.95 Mach speed. 56-0739 F-104A XQF-104A QFG-739 in April 1960, shot down October 8, 1963 by GAR-2B (Sidewinder) missile; 1 drone flight. 56-0741 JF-104A QFG-741 on November 30, 1961, April 24, 1971 barrier engagement, lost on landing on May 16, 1972 after loosing control of the drone; 22 drone flights. 56-0743 JF-104A QFG-743 on November 17, 1961, written off September 25, 1968, lost pitch control, crashed into the golf of Mexico; 2 drone flights. 56-0744 JF-104A QFG-744, QF-104A conversion Palmdale (April 1961-November 1961), stored SMAMA at McClellan AFB (14. November 1961-31. July 1962), QFG-744 3205th DS (October 1967-23.January 1968), January 23, 1968 dropped from inventory due to flying accident, possibly no live drone flights as QF-104A. 56-0745 JF-104A QFG-745 on October 10, 1961, crashed January 17, 1962 due to elevator malfunction on takeoff, 1st QF-104 loss, 2 drone flights before; total 3 drone flights. 56-0746 F-104A QFG-746, shot down March 17, 1964 by Bomarc surface-to-air missile; 1 drone flight. 56-0747 F-104A QFG-747, March 22, 1967 hit by AIM-4D, destruction failed, recovered, flown again, shot down July 13, 1971 with AIM-4H, 11 drone flights. 56-0796 F-104A QFG-796 crashed on landing, sheared nose gear, left runway, rolled over and burned on December 13, 1962, written off; 1st unmanned drone flight. 56-0836 F-104A QFG-836 on September 28, 1962, shot down October 3, 1963 by GAR-2B (Sidewinder) missile; total of 2 drone flights. After their withdrawal, about 24 early Starfighter were converted by Lockheed from 1960 onward as remotely-controlled QF-104A. 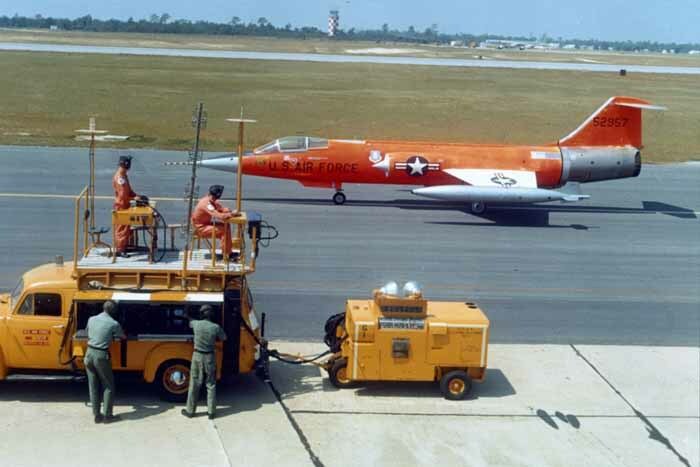 Painted pillar-box red overall, the QF-104As, including some with 4 under wing drop tanks for extended endurance, were operated by the USAF 3205th Drone Squadron from Eglin AFB, Florida on both manned and pilotless test missions. In view of the F-104's demanding flight characteristics, and the relatively primitive remote radio control at that time, the latter must have proved particularly interesting. Modifications to the airframes included the installation of radio gear to allow the jet to be flown in NULLO (Not Under Live Local Operation, or unmanned) form, however pilots were often included to ensure the jet made it back if the Remote Control gear failed. A source of pride for the pilots was when they were able to nurse a damaged jet back to base. When the Starfighters were flown remotely, the joke that "Capt Nolo" was flying was often used. Nolo translating loosely from Latin, nothing or empty. Additional modifications were passive sensors placed around the nose and tail, used to record data on missile "hits" or near misses. Each jet was subsequently repainted in an all-over day-glow orange scheme; however, a few QF-104s received a white paint job in place of the orange. In the hot and humid Florida sun, this paint weathered quickly and many of the jets looked like they were derelict, even thought they were very much active! These unique looking Starfighters retained all of their weapons delivery capabilities, with the exception of the M61 20 mm machine gun, which was removed and faired over in a similar fashion as the Aeronautica Militare Italiana (AMI or Italian AF) F-104S. The 170 gallon tip tanks and 195 gallon under-wing fuel tanks were a staple of QF-104 operations due to its poor range, but the wing tip mounted tanks were occasionally substituted with AIM-9 Sidewinder missiles when the mission dictated. At the time of QF-104 operations, the US Military was just getting into the thick of the Vietnam War. Targets included roads on the Ho Chi Min Trail, or to destroy bridges in the hopes of stopping the supply of arms into the country. Although not directly in the fight, the 3025th was doing there part to aid their brothers in arms. One of the missions tested by the drones was a remotely controlled "attack" on the Destin Bridge, just south of Eglin AFB. The idea was to pack an aircraft full of explosives and fly it into a hardened target, such as a bridge or cave enclosure where weapons or personnel were being hidden. 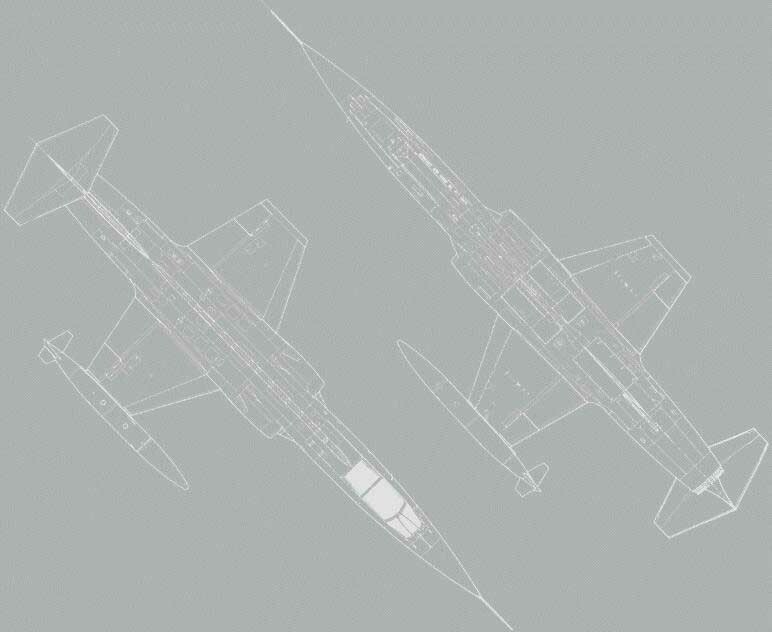 That mission profile is reminiscent of the drone Hellcats from Korea and the Mistal combination of a FW-190 and an explosive laden Ju-88 used by the German Luftwaffe in WWII. Along with flying bright orange aircraft, the pilots of the 3025th wore Air Defense Command (ADC) issue high-visible orange flight suits when the rest of the Air Force was wearing the standard green. Adding to their special status above normal F-104 drivers, some of the young and cocky newcomers to the program, would continue to wear their heal spurs as they swaggered across the ramp. Apparently this practice was considered taboo within the rest of the F-104 community, but a blind eye was cast for this group, due to the nature of their trade. While many of the 3025th Drone Squadron pilots, maintainers and support personnel remain anonymous, the name of BGen (ret) Steve Ritchie stands out for his exploits as an F-4 Phantom II pilot in Vietnam. Following his graduation from the Air Force Academy, he went on to graduate first in his Undergraduate pilot training at Laughlin AFB in Laredo, Texas. Conversion training into the F-104 was carried out at George AFB in southern California and upon completion, then Lt Ritchie received an assignment to Eglin AFB, flying the QF-104A. The 3205th DS (Drone Squadron) Eglin AFB, Florida flew a total of 162 unmanned missions.